For those who haven't heard about it yet, School rivals Ateneo and La Salle go head to head in the 71st season of the UAAP. Game 1 went to Ateneo and Game 2 is going to be a pivotal point for both teams as this is a best of 3 finals series. 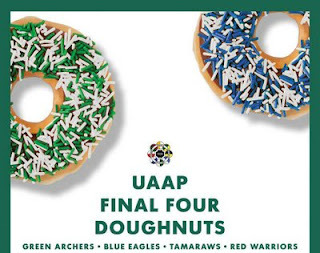 And in line with the UAAP, Krispy Kreme has embraced the UAAP games and loyalty by presenting 4 donuts each with their own colors representing the final 4 schools which made it to the UAAP finals. Needless to say, the green donut is for Lasallites and the blue donut is for Ateneans. Whether you want to take a bite out of the rival school's donut to signify you'll chew them up or take a bite and prove that your donut tastes much better, Krispy Kreme wins.